Store and archive of original vintage company sleeves for 10“ 78rpm records. Our stock contains more than 35000 sleeves. They are offered by company and type. Of international companies they can be found in a chronological order by country. Our archive contains about 3000 different sleeve types of which many only are presented by one or two copies. These are not for sale. The sales stock contains of about 30.000 sleeves covering about 390 different types which are available through our site. Whenever we have more than 20 copies of the same sleeve type, they are offered for sale. Sleeve types of which we only have a stock of less than 20 copies are not available for technical reasons yet. We have thousands more so far unsorted sleeves in stock. Therefore our sales stock is growing on a permanent basis. Further sleeve types shall be available in the future. If there are several of these blemishes found on one cover this is graded Q 2. Q 2 = good average copy. This sleeve still covers a record. 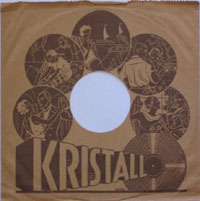 Q 3 sleeves are suitable for accompaniment of a 78rpm record inside a transparent PVC protection cover. At least one side is good looking. The sleeves had been classified by our staff according to this grading schedule. Their estimation might differ from one to another employee. Please regard the grading schedule as a rough key for classifcation. Our staff is asked to grade rather conservative once they are uncertain about the condition of an item. We cannot guarantee the availability of the sleeves due to the limitation of stock. Of some types we have less than 25 copies of one type available spread over 3 quality classes. Sleeves are sold on a „first come – first serve“ basis. The update of available quantities is done twice or three times per month.